It doesn’t receive much direct investigation, but given how little actually survives from the second century of early Christianity, any text with a claim to such antiquity should receive attention, including the Martyrdom of Polycarp. Quintus [in the text of the Martyrdom of Polycarp] was one who rushed to martyrdom. He believed Christians should actively seek out martyrdom. … It may be significant, too, that Quintus is singled out as a Phyrgian. It was in Phrygia that the anarchic Montanist movement began from around 168 CE. The Montanists were notorious for their wild prophetic utterances and zealous seeking of martyrdom. The problem of suicidal volunteering for martyrdom was a phenomenon of the late second and third centuries. Polycarp was supposed to have been martyred 155 CE. The scholarly argument over the date of the martyrdom of Polycarp (the event, not the text) has tended to clump around the 150s AD (with 155 AD indeed being a popular suggestion) and the 160s AD (with 167/168 AD being the impression gained from the chronicle of Eusebius). Leaving aside this argument over the exact year of the death of Polycarp (with its discussion of the secular synchronisms and the mention of a great sabbath), the document may indeed have been a response to the Montanist controversy. It does make sense, especially of the episode quoted, which goes beyond narrating an all-but-volunteer martyr (Polycarp) to showing evidence of knowledge of the controversy behind volunteer martyrdom (in Quintus). I’d say it’s a good case and probable too, actually. But that only brings us up to a terminus a quo of the late second century, 170 AD forward, the approximate time the Montanists enter the scene, which still is compatible with authorship at the hand of a contemporary to Polycarp. The fear of martyrs being worshiped in place of Christ is nowhere else attested until the fourth century CE. The interest in venerating human bones as holy relics is nowhere else a problem until the third century CE. This is quite relevant evidence. Although some may want to stress that it is inconclusive, I want to stress that Godfrey hasn’t represented this evidence as conclusive but rather suggestive. It’s a factor for consideration, even though it may in some part be emptied of its force by the scene in Acts 19:11-12 where people are concerned, at least, for possessing objects that Paul had touched (of which Godfrey is aware, hence the phrasing he gives above). Of course there are also the literary parallels that could be drawn between the martyrdom of Polycarp and the martyrdom of Pionius (ca. 250 AD) and the outright evidence of the two myths living side by side in a mythic martyrdom cycle. Here’s some links on the matter, with Lightfoot’s discussion the best of these. (1) The Polycarp myth, historically-based or otherwise, become further developed in the Pionius myth. (2) The historical Pionius emulated the example of Polycarp, a legendary martyr. (3) The Pionius myth, historically-based or otherwise, was the model for the text, the Martyrdom of Polycarp. This obviously genuine and contemporary account of the martyrdom of Polycarp, in the form of a letter from the Church of Smyrna to the Church of Philomelium, is the earliest known history of a Christian martyrdom, the genuineness of which is unquestionable, and its value is enhanced by the fact that in the extant MSS. a short account is given of the history of the text. From this it appears that Gaius, a contemporary of Irenaeus who had himself seen Polycarp when he was a boy, copied the text from a manuscript in the possession of Irenaeus. Later on Socrates in Corinth copied the text of Gaius, and finally Pionius copied the text of Socrates. Pionius, who is supposed to have lived in the 4th century, says that the existence of the document was revealed to him in a vision by Polycarp, and that when he found it the MS. was old and in bad condition. Now the Acts are extant of a Pionius who was martyred under Decius (a.d. 250) while celebrating the birthday of Polycarp. There is also a Life of Polycarp extant (incorporating this very Letter of the Smymaeans), which purports to have been written by this Pionius, but is manifestly the work of a forger of the fifth century. (1) Acts of Pionius, an account of the 3rd century martyr Pionius under Decius that also speaks of the martyrdom of a Marcionite Metrodorus. (2) The Life of Polycarp, attributed to Pionius, a larger account of the life and death of Polycarp that contained the Letter of the Smyrnaeans (in portions now lost), which claims that Pionius found lost manuscripts. (3) The Martyrdom of Polycarp, also known as the Letter of the Smyrnaeans, which is preserved for us in medieval manuscripts as a separate text from the Life of Polycarp and which was also quoted by Eusebius. The writer of the Pionian Life is therefore the author of the History of the Transmission. One further fact remains to be recorded. Not only do the Pionian Life and the History of the Transmission appeal without scruple to ancient documents which have no existence. They abound largely in the supernatural. Now our extant mss of the Smyrnaean Epistle have the Pionian postscript and therefore repre sent the Pionian edition of that Letter. Eusebius alone of all extant authorities is prior to the false Pionius and gives an independent text Now our spurious Pionius was before all things a miracle-monger. Among other miracles he relates that on the eve of Polycarp’s appointment to the episcopate a dove hovered round his head. So also in the Letter of the Smymaians a dove is found leaving his body when his spirit is wafted to heaven (§ 16). But this miracle appears only in the Pionian copies, not in Eusebius. Moreover, by the abruptness of its appearance an interpolation is suggested. Is it not the same dove which appears on the two occasions, and was it not uncaged and let fly by the same hand? We cannot resist the suspicion that our spurious Pionius was responsible for both these appearances. (1) An original Letter of the Smyrnaeans is written before Eusebius, who quotes it. (2) The Letter of the Smyrnaeans is embedded in the Life of Polycarp, and the author gives us the story of how Pionius found the Letter, the chapter regarding the transmission the text from Irenaeus to Pionius, and the sixteenth chapter with its miracle story paralleling his own invention. (3) Later chapters are added even later, after the Letter of the Smyrnaeans re-enters textual transmission in a copy from the Life of Polycarp. The whole sequence, moving from independent Letter to embedded text and back again, is remarkable enough and contrary enough to Ockham’s razor that we would not believe it if we did not have evidence of it. This is why the quotes from Eusebius are the lynchpin of how we understand the matter. The letter in Eusebius starts the same way as the Pionian letter. Lightfoot’s evidence for placing the version of Eusebius prior to the one known to us is, unfortunately, equivocal at best. Eusebius gives a paraphrase of the contents of the letter. That some details may not have attracted his attention does not mean that Eusebius attests to a text without them. In fact Eusebius does refer directly to chapter 16, when he writes, “And when he had done this there came forth a quantity of blood so that it extinguished the fire,” referring to the Pionian text’s “there came out a dove, and much blood, so that the fire was quenched.” The insertion of two words could have happened after Eusebius wrote, as Lightfoot supposes, without assuming it was by the same author of the rest of the Life of Polycarp. Or, without resorting to an amendation hypothesis, there could be no insertion at all but rather an omission by Eusebius himself, who may have found the detail strange in its context and unworthy of quotation. In that case, it could be by the same author as the Life of Polycarp, but that author may be prior to Eusebius. But what document was Eusebius actually reading? Was it a larger text that contained the Life of Polycarp or just the stand-alone Letter of the Smyrnaeans? Eusebius gives us his own account of where he find this letter. Whatever this larger account was, the letter known to Eusebius was not stand-alone as it is now. Eusebius has telescoped the chronology of its contents when placing Pionius, also in the text before him, next to Polycarp. Of such an end was the admirable and apostolic Polycarp deemed worthy, as recorded by the brethren of the church of Smyrna in their epistle which we have mentioned. In the same volume concerning him are subjoined also other martyrdoms which took place in the same city, Smyrna, about the same period of time with Polycarp’s martyrdom. Among them also Metrodorus, who appears to have been a proselyte of the Marcionitic sect, suffered death by fire. A celebrated martyr of those times was a certain man named Pionius. Those who desire to know his several confessions, and the boldness of his speech, and his apologies in behalf of the faith before the people and the rulers, and his instructive addresses and, moreover, his greetings to those who had yielded to temptation in the persecution, and the words of encouragement which he addressed to the brethren who came to visit him in prison, and the tortures which he endured in addition, and besides these the sufferings and the nailings, and his firmness on the pile, and his death after all the extraordinary trials,—those we refer to that epistle which has been given in the Martyrdoms of the Ancients, collected by us, and which contains a very full account of him. Thus the Martyrdom of Polycarp is only as old as the work in which it was embedded, and that work survives in the form of the incomplete text known as the Life of Polycarp. This Life of Polycarp, we must then suppose, on the account of Eusebius, is nothing more than a manuscript fragment surviving of the still larger work known to Eusebius in which the letter was embedded. The accounts referred to [by Eusebius] are not found in any of our mss. of the epistle, but there is published in Ruinart’s Acta Martyrum Sincera, p. 188 sq., a narrative in Latin of the martyrdom of a certain Pionius and of a certain Marcionist Metrodorus, as well as of others, which appears to be substantially the same as the document which Eusebius knew in the original Greek, and which he refers to here. The account bears all the marks of genuineness, and may be regarded as trustworthy, at least in the main points. But Eusebius has fallen into a serious chronological blunder in making these other martyrs contemporaries of Polycarp. We learn from a notice in the document given by Ruinart that Pionius, Metrodorus, and the others were put to death during the persecution of Decius, in 250 a.d., and this date is confirmed by external evidence. The document which Eusebius used may not have contained the distinct chronological notice which is now found in it, or Eusebius may have overlooked it, and finding the narrative given in his ms. in close connection with the account of Polycarp’s martyrdom, he may have jumped hastily to the conclusion that both accounts relate to the same period of time. Or, as Lightfoot suggests, in the heading of the document there may have stood the words ἡ αὐτὴ περίοδος τοῦ χρόνου (a peculiar phrase, which Eusebius repeats) indicating (as the words might indicate) that the events took place at the same season of the year, while Eusebius interpreted them to mean the same period of time. Upon these Acts, and upon Metrodorus and Pionius, see Lightfoot, I. p. 622 sqq. There is not sufficient evidence that the text Eusebius knew also contained the text that we know as the Acts of Pionius. The text that Eusebius knew contains the Letter of the Smyrnaeans and consequently the Life of Polycarp, but the manner of narration in the Acts of Pionius is rather different. But there was still, on the evidence of Eusebius, an account that he quoted that contained the Letter of the Smyrnaeans, by inference the Life of Polycarp, and again by direct indication the martyrdoms of Pionius and Metrodorus. Lightfoot argues that the Acts of Pionius are close to the events and largely historical, and I see no reason to disagree with him. This suggests that a separate document that narrates the martyrdom of the same person is likely dependent on the Acts of Pionius. This is indeed what we should suggest. After the publication of the martyrdoms of Pionius and others under Decius, there is a need for a better understanding of Polycarp’s significance more than ever before. That need is met through a text that we now know only from the Life of Polycarp and the Letter of the Smyrnaeans. It includes accounts regarding twelve martyrs of Smyrna and Philadelphia, of whom Polycarp is the leading example. It also includes accounts of the martyrdom of Pionius, Metrodorus, and some others under Decius. The artifice that makes this possible is also evident. The author of the Life of Polycarp attributes to Pionius both visions from Polycarp and discoveries of ancient texts. He is in this way a revealer of the previously unknown history of the martyrs of the apostolic times, including Polycarp himself. The text makes Pionius serve in this role in the first volume, while in the sequel that is lost to us the narration relied on the Acts of Pionius for its facts and stories (including the fact of Metrodorus being a Marcionist, a particular detail that Eusebius doesn’t miss). At the outset, I did not actually expect to vindicate Neil Godfrey’s line of argument, but when I try to work out the web of relationships in the texts before us—Acts of Pionius, Life of Polycarp, Eusebius, and Martyrdom of Polycarp—the simplest and strongest explanation as I perceive it is that Eusebius is quoting from the same text surviving in the Life of Polycarp and excerpted in the Martyrdom of Polycarp, a text that used the Acts of Pionius for a source. The Martyrdom of Polycarp is an excerpt of the letter from its context performed after Eusebius, maybe quite some time after given the late date of the manuscripts, similar to the manner in which the Acts of Paul and Thecla have been liberated from the longer Acts of Paul (and I suppose other examples may be furnished), as also Lightfoot supposed. Unlike Lightfoot supposed, the letter did not have a prehistory other than its context as it is embedded in the text known to us as the Life of Polycarp. The economics and homiletics of preserving separately just the chapters containing the letter that speaks so well of Polycarp’s martyrdom and his date of death are simple and explain its separation. The letter of Polycrates as quoted by Victor shows earlier knowledge of a historical Polycarp of Smyrna, as does Irenaeus of Lyons. Irenaeus in the remaining fragments refers to the letter to the Philippians but not a letter of the Smyrnaeans, although this of course doesn’t by itself prove anything. However, as demonstrated above, the letter quoted by Eusebius and excerpted in the manuscripts of the Martyrdom of Polycarp is created by that same author who writes the Life of Polycarp and bears the marks of being part of the larger narrative. This is demonstrated through the reference in chapter 20 (to a numbering of martyrs), through the account of Eusebius (who places it with an account of the death of Pionius), and through the story of its discovery (connecting chapter 22 to allusions in the Life of Polycarp) due to a revelation by the third century martyr Pionius. That detail can now be read as a tale of how the letter came to emerge so late at a time when it would be suspicious that it was not being read for decades prior. The author is involved in a mythic telling of the martyrdoms of ancients such as Polycarp as seen through the experience of the persecution of Decius, the celebration of the feast days of the legendary Polycarp, the problems of bodily relics and martyr veneration with such ancients, and the controversy of enthusiasm for martyrdom spawned by the Montanists. Weighed on the evidence and as an explanation of the text, this context fits better and explains more. One last difficulty remains here. The text both speaks in the first person as Pionius and, as paraphrased by Eusebius, narrates his death. The text that survives as a Life of Polycarp may be quoted from a supposed letter of Pionius, just as the text that survives as a Martyrdom of Polycarp is the supposed letter of the church at Smyrna through Evarestus. 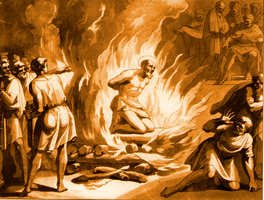 The surviving Life of Polycarp is not much longer than the Martyrdom of Polycarp itself. Both may have been part of a larger work (“the Martyrdom of the Ancients” quoted by Eusebius) that incorporated several accounts of martyrdom. Join the forum to add your two cents. Got Feedly? Add this blog to your reader. Enter your email for updates on new posts. Why Not Talk About This Instead? Absent the Testimonium, Does the Reference to Jesus in 20.9.1 Hold? So You Wanna Read the Church Fathers, Eh? Mara bar-Serapion: a product of the fourth century?